This week I have left the not-so-summery weather of LA and travelled to New York where I am soaking up every stitch of fashion imaginable in New York’s Fashion Week. I was so fortunate to attend yesterday’s IFB’s conference at the Hudson Hotel and met some of my fellow Blog-Gals in all their fabulosity. Today, I’m going to venture to Central Park and look for more of the fabulous Blog-Gals at the Style Renegade. Tonight is the uber-fab Fashion’s Night Out where I’ll be going to as many events as traffic will allow me. :) My associate will be covering the events at the Beverly Center and anywhere else traffic will let him get to as well so we’ll be toasting you from Coast to Coast tonight! I hope that you have made plans and itineraries you’re your gals to be out on Fashion’s Night Out enjoying the chilled Champers and free gifts! Sunday, I’m going to attending the Chictopia Media Summit hoping to get to meet anyone else I haven’t yet. :) So thanks for bearing with me in these “drought” blog moments, as I’m heels deep into putting great stuff together for you next week! Looking at April’s design, I really liked the top part of the dress. It has a really interesting neckline which inspired my pairing of these very practical 'Air Pastine Gladiator's that are Maria Sharapova by Cole Haan. Even the name of the sandal goes with the feel of the top, very airy. And come to think of it, strangely, I get some similiarities between April and Maria… maybe its just me. Anywho, this sandal is a great compliment to April’s design because of the lines of the straps. 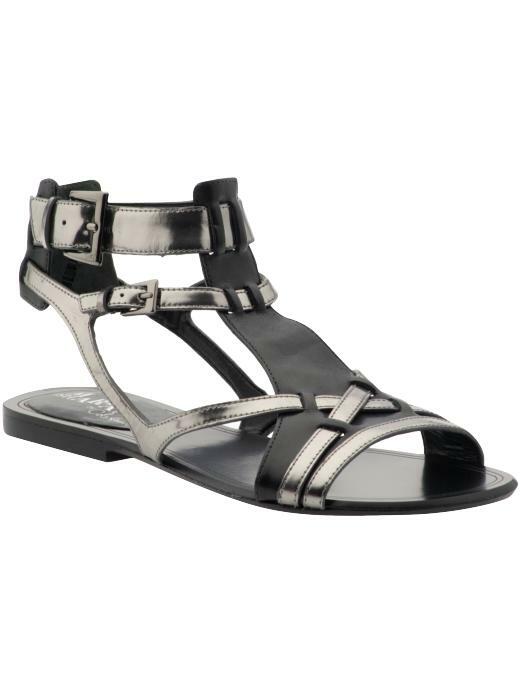 I have to say that I adore the shiny gun metal with the black elements of the sandal that really give you that lightness of resort wear even though it’s a mostly black and dark look. It gives you just enough glimmer to give more interest to the outfit. Plus, we get the bonus of Nike Air technology in this Maria Sharapova designed Cole Haan sandal. I think that the flat sandal makes the overall look much more wearable and practical. Right now, they're even on sale on Piperlime.com for $99.99, reduced from their regular $158 price. Hey lady! It was so great to meet you this week at the blogger meetup and then run into again at FNO. Just thought I would stop by and check out your site. Loving the blog. Hope you had fun at FNO. hey..my friend/coworker cynthia and her froend amy (who is so sweet) went with you to the fashion night out. She said she had a blast, she invited me to go with u all, but I had school. She gave me ur card to check out ur blog because I blog as well. I luv shoes but can the hurt my feet so much! !